If you prefer a softer glow on your Christmas tree or holiday decorations, this warm white bulb will meet your decorating needs. For a warm accent inside your home, drape these strings of lights around pine garland on a stair railing. Many outdoor uses make these lights excellent for year-round decorating or entertaining. These LED bulbs, which are packaged 25 to a bag, are both energy saving and perfect for indoor and outdoor use. I bought these to have them available to replace any of my existing warm white LED bulbs. LEDs last much longer than standard incandescent bulbs, but they don't last forever. These matched my existing bulbs perfectly and they are nearly indestructible. These will probably keep me in supply for a few years, but I won't hesitate to buy more if I need to. These bulbs look great - wonderful warm glowing color. The faceted finish is really nice. I can't wait to see them light up our city's Christmas tree! Q: How many LEDs in each bulb? A: You've asked a super interesting question. These bulbs are part of a new line of LED bulbs that we are changing to as they arrive. Our old style had 3 traditional LED's. Now these bulbs have 2 LED's but they are SMD -- surface mounted devices -- I think one company is calling them "Opticore" --- it means that they are about 20% brighter. We aren't promoting that difference much at this time since that is so subjective. Does that help you as you search for bulbs? These are made to our specifications in the minleon factory. Q: I am trying to match my current LED's. If I order what are the return policies? 1. There is a wide range of what is considered "white"
2. White - even from the same company - will change slightly from season to season. 3. After a few weeks of operation, burn in occurs and the color will slightly change. 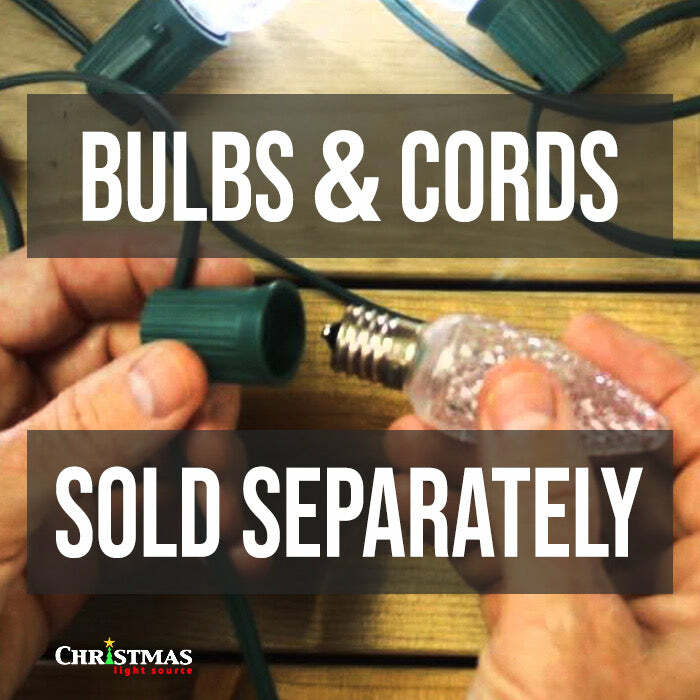 So, two sets purchased at the same time would be slightly different in color if one set were plugged in for a season then plugged in together with the second set a year later. I would not initially purchase more than one set of lights or one bag of bulbs if you are trying to match colors. Return any uninstalled/non-unwound products in their original packaging to the following address and we'll credit the account used during purchase for the items. We do not credit shipping charges. Please ship with tracking and insurance. Items must be returned within 30 days of receipt to avoid a 15% restocking fee. Returns are not accepted after 45 days from date of purchase. A: Sorry, we don't ship to Canada at this time.